Al-Qassim Region has a diverse range of heritage buildings and sites, as mentioned in many references. King Abdul Aziz Palace in Qebah town is one of the significant historical buildings which were built by order of King Abdul Aziz in 1351 AH in Al-Qassim Region — sustainingthe historic buildings as an approach to economic diversity adopted by Saudi Vision 2030, to reduce Saudi Arabia's dependence on oil. This paper aims to discuss the sustainability of historical buildings in Al Qassim Region with the help of the implementation of conservation policies in order to enhance the diversity of the economy. BINDAJAM, Ahmed Ali; AL-ANSI, Nashwan Abdulkarem. The Sustainability of Historic Buildings in Achieving Economic Diversity: A case study Qebah Palace. 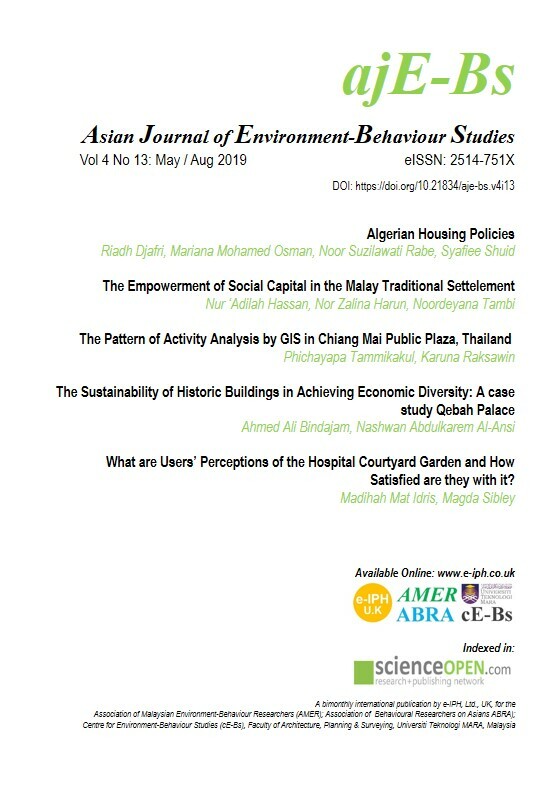 Asian Journal of Environment-Behaviour Studies, [S.l. ], v. 4, n. 13, p. 45-59, apr. 2019. ISSN 2514-751X. Available at: <https://aje-bs.e-iph.co.uk/index.php/ajE-Bs/article/view/347>. Date accessed: 21 apr. 2019. doi: https://doi.org/10.21834/aje-bs.v4i13.347.